CBI - China: Day 35 of 154 of the Japanese Invasion of Manchuria. Spain: Day 98 of 985 of the Spanish Civil War. CBI - China: Day 3 of 29 of the 1st Battle of Suiyuan. Spain: Day 463 of 985 of the Spanish Civil War. CBI - China: Day 108 of 2,987 of the 2nd Sino-Japanese War. Day 71 of 106 of the 2nd Battle of Shanghai. Day 52 of 70 of the Battle of Taiyuan. Spain: Day 828 of 985 of the Spanish Civil War. CBI - China: Day 473 of 2,987 of the 2nd Sino-Japanese War. Day 134 of 139 of the Battle of Wuhan. Day 11 of 81 of Japan's Operation GUANGDONG. Poland: Soviet-occupied Poland now called "Western Byelorussia" and "Western Ukraine." USSR enact laws to make these areas totally Russian in every way. CBI - China: Day 838 of 2,987 of the 2nd Sino-Japanese War. Atlantic: Royal Canadian Navy destroyer MARGAREE collides with Allied freighter PORT FAIRY in poor visibility, 400 miles west of Ireland. ETO - UK: Day 47 of 258 of the Blitz. ETO - UK: Day 105 of 114 of the Battle of Britain. East Africa: Day 135 of 537 of Italy's East African campaign in the lands south of Egypt. CBI - China: Day 1,204 of 2,987 of the 2nd Sino-Japanese War. Day 343 of 381 of the Battle of South Guangxi. CBI - Thailand: Day 22 of 221 of the Franco-Thai War (Vichy France vs Thailand). ETO - France: Fifty local hostages are shot in Nantes in reprisal for Resistance assassination of a German military commander. Fifty more to die if the assassin isn't turned over. Say what you will about the French military and political leadership over the years, it's impossible to not respect and admire the bravery, gallantry, tenacity and sacrifice of the French Resistance during World War Two. 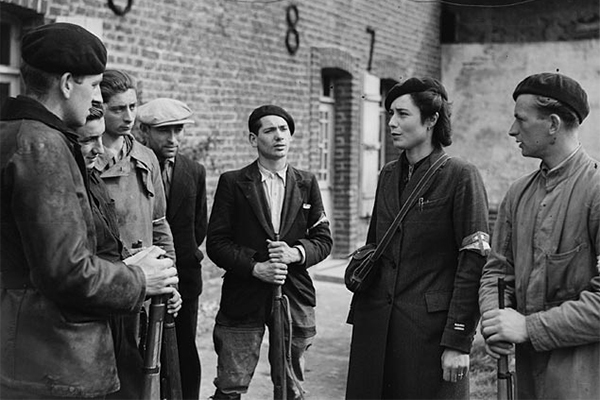 What we've come to know collectively as "The French Resistance" began to form immediately upon the fall of France, with different groups rising to engage in guerrilla warfare against Germany for different reasons, quite independent of each other. The 20 Oct 41 assassination of a German field commander was carried out by communist fighters who had no real allegiance to France, but rather to the defeat of Fascism and the establishment of a Communist government in France, which would then have direct allegiance to the Soviet Union. Their specialty was capturing German army officers and executing them, which was always answered with swift reprisals from the Germans, which did not stop the assassinations. In 1943, the communists claimed that they were killing 500 to 600 German soldiers per month. Russian Front - Finland: Day 116 of 142 of Operation SILVER FOX, a joint German-Finnish campaign to capture the Russian port of Murmansk in the Arctic. Russian Front - Finland: Day 114 of 140 of Operation ARCTIC FOX, a joint German-Finnish campaign against Soviet Northern Front defenses at Salla, Finland. Russian Front - Finland: Day 123 of 164 of the Battle of Hanko. The Soviets will be forced off their leased naval base. Russian Front: Day 123 of 167 of Germany's Operation BARBAROSSA. Russian Front - North: Day 45 of 872 of the Siege of Leningrad. Russian Front - Center: Day 21 of 98 of the Battle of Moscow. Russian Front - South: Day 3 of 5 of the 1st Battle of Kharkov, Ukraine. MTO - Libya: Day 196 of 256 of the Siege of Tobruk. East Africa: Day 500 of 537 of Italy's East African campaign in the lands south of Egypt. CBI - China: Day 1,569 of 2,987 of the 2nd Sino-Japanese War. ETO - Germany: SS put down a revolt at Sachsenhausen by a group of Jews who were about to be sent to Auschwitz. Russian Front - North: Day 410 of 872 of the Siege of Leningrad. Russian Front - North: Day 171 of 658 of the Siege of the Kholm Pocket, USSR lays siege to the Kholm Pocket but the Germans hold out for a about a year and a half. Russian Front - South: Day 117 of 150 of Germany's CASE BLUE, the failed offensive to take the Caucasus oil fields. Russian Front - South: Day 61 of 165 of the Battle of Stalingrad, bloodiest battle in human history. MTO - Egypt: US B-25s bomb enemy airfields while P-40s fly sweeps in the battle area west of El Daba. East Africa: Day 171 of 186 of the Battle of Madagascar. CBI - China: Day 1,934 of 2,987 of the 2nd Sino-Japanese War. PTO - Alaska: Day 138 of 435 of the Battle of Kiska, Aleutian Islands. The US and Canada will defeat the Japanese invaders. PTO - Malaya: Day 246 of 357 of the Battle of Timor Island, a long guerrilla war ending in Japanese victory. PTO - New Guinea: Day 94 of 119 of the Battle of the Kokoda Track. The Australians continue pushing back the Japanese troops. PTO - Solomon Islands: Day 77 of 187 of the Battle of Guadalcanal. ETO - Germany: Operation CORONA (the jamming of German night-fighter communications) begins during an RAF raid on Kassel. Russian Front - North: Day 775 of 872 of the Siege of Leningrad. Russian Front - North: Day 536 of 658 of the Siege of the Kholm Pocket. USSR lays siege to the Kholm Pocket but the Germans hold out for a about a year and a half. Russian Front - South: Day 60 of 122 of the Battle of the Lower Dnieper River, USSR. MTO - Italy: US 12th Air Force B-25s and B-26s conduct bombing raids throughout Italy. MTO - Greece: US 9th Air Force B-24s bomb Maritsa Airfield on Rhodes and Eleusis Airfield. This is the 9th AF's final mission operating from Africa before relocating to England. CBI - China: Day 2,299 of 2,987 of the 2nd Sino-Japanese War. PTO - New Guinea: Day 34 of 219 of the Battle of Shaggy Ridge. PTO - New Guinea: Day 31 of 162 of the Battle of the Huon Peninsula. Will result in an Allied victory. ETO - France: Day 83 of 284 of the Battle of Brittany. ETO - Belgium: Day 51 of 62 of the liberation of Belgium. ETO - Belgium: Day 21 of 38 of the Battle of the Scheldt Estuary. ETO - France: Day 38 of 236 of the Siege of Dunkirk. ETO - Germany: Day 34 of 145 of the Battle of Hürtgen Forest. ETO - Germany: US 8th Air Force B-17s and B-24s hit targets in Germany. Russian Front - Finland: Day 38 of 223 of the Lapland War. Finland and Russia have joined forces to kick the Germans out of Finland's most northern province. Russian Front - Finland: Day 16 of 23 of the Petsamo-Kirkenes Offensive. The Soviets will drive the Germans out of the Arctic region in northern Scandinavia. Soviet troops are advancing in Norway. Russian Front - North: Day 39 of 41 of the Battle of Riga, Latvia. Russian Front - Center: Day 8 of 206 of the Battle of the Courland Pocket in Latvia. Germans will hold this area until the very end of the war. Russian Front - Center: Day 18 of 18 of the Battle of Memel, a border town of Lithuania and East Prussia. The Germans continue to hold the Niemen line. The Soviets stop fighting and lay siege instead. Day 1 of 99 of the Siege of Memel, which will last until 28 Jan 45. Russian Front - Center: Day 39 of 72 of the Battle into East Prussia and northern Poland. Russian Front - Center: Day 7 of 15 of the Battle of Goldap, East Prussia. Russian Front - South: Day 17 of 24 of the Battle of Debrecen, Hungary. Russian Front - South: Day 39 of 72 of the Battle of Belgrade, Yugoslavia. MTO - Germany: US 15th Air Force B-24s and B-17s bomb at Munich. Other B-24 units attack at Larissa, Greece. MTO - Italy: British 8th Army forces a battle with the enemy along the Marecchia River. MTO - Italy: US 12th Air Force provides air cover for the US 5th Army who are in pursuit of enemy troops withdrawing from areas near Pistoia. CBI - Burma: Day 205 of 302 of the Chinese Salween Offensive in Burma. CBI - China: Day 2,665 of 2,987 of the 2nd Sino-Japanese War. Day 189 of 259 of Japan's Operation ICHI-GO. PTO - New Guinea: Day 313 of 597 of the Battle of New Britain. PTO - New Guinea: Day 184 of 481 of the Battle of Western New Guinea. PTO - Palau Islands: Day 38 of 74 of the Battle of Peleliu (Operation STALEMATE II). PTO - Palau Islands: Day 36 of 36 of the Battle of Angaur, part of the larger Operation STALEMATE II. The battle ends in a US victory. PTO - Philippines: Day 3 of 299 of the 2nd Battle of the Philippines, aka the Liberation of the Philippines or the Philippines Campaign. PTO - Philippines: Day 3 of 73 of the Battle of Leyte. Set of 4 absorbent natural stoneware coasters in wooden display holder with classy WWII nose art designs.